For other uses, see Tundra (disambiguation). In physical geography, tundra (/ˈtʌndrə, ˈtʊn-/) is a type of biome where the tree growth is hindered by low temperatures and short growing seasons. The term tundra comes through Russian тундра (tûndra) from the Kildin Sami word тӯндар (tūndâr) meaning "uplands", "treeless mountain tract". Tundra vegetation is composed of dwarf shrubs, sedges and grasses, mosses, and lichens. Scattered trees grow in some tundra regions. The ecotone (or ecological boundary region) between the tundra and the forest is known as the tree line or timberline. There are three regions and associated types of tundra: Arctic tundra, alpine tundra, and Antarctic tundra. Arctic tundra occurs in the far Northern Hemisphere, north of the taiga belt. The word "tundra" usually refers only to the areas where the subsoil is permafrost, or permanently frozen soil. (It may also refer to the treeless plain in general, so that northern Sápmi would be included.) Permafrost tundra includes vast areas of northern Russia and Canada. 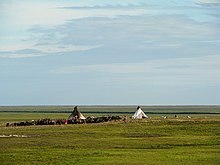 The polar tundra is home to several peoples who are mostly nomadic reindeer herders, such as the Nganasan and Nenets in the permafrost area (and the Sami in Sápmi). Arctic tundra contains areas of stark landscape and is frozen for much of the year. The soil there is frozen from 25 to 90 cm (10 to 35 in) down, making it impossible for trees to grow. Instead, bare and sometimes rocky land can only support certain kinds of Arctic vegetation, low growing plants such as moss, heath (Ericaceae varieties such as crowberry and black bearberry), and lichen. There are two main seasons, winter and summer, in the polar tundra areas. During the winter it is very cold and dark, with the average temperature around −28 °C (−18 °F), sometimes dipping as low as −50 °C (−58 °F). However, extreme cold temperatures on the tundra do not drop as low as those experienced in taiga areas further south (for example, Russia's and Canada's lowest temperatures were recorded in locations south of the tree line). During the summer, temperatures rise somewhat, and the top layer of seasonally-frozen soil melts, leaving the ground very soggy. The tundra is covered in marshes, lakes, bogs and streams during the warm months. Generally daytime temperatures during the summer rise to about 12 °C (54 °F) but can often drop to 3 °C (37 °F) or even below freezing. Arctic tundras are sometimes the subject of habitat conservation programs. In Canada and Russia, many of these areas are protected through a national Biodiversity Action Plan. Tundra tends to be windy, with winds often blowing upwards of 50–100 km/h (30–60 mph). However, in terms of precipitation, it is desert-like, with only about 150–250 mm (6–10 in) falling per year (the summer is typically the season of maximum precipitation). Although precipitation is light, evaporation is also relatively minimal. During the summer, the permafrost thaws just enough to let plants grow and reproduce, but because the ground below this is frozen, the water cannot sink any lower, and so the water forms the lakes and marshes found during the summer months. There is a natural pattern of accumulation of fuel and wildfire which varies depending on the nature of vegetation and terrain. Research in Alaska has shown fire-event return intervals (FRIs) that typically vary from 150 to 200 years, with dryer lowland areas burning more frequently than wetter highland areas. The biodiversity of tundra is low: 1,700 species of vascular plants and only 48 species of land mammals can be found, although millions of birds migrate there each year for the marshes. There are also a few fish species. There are few species with large populations. Notable animals in the Arctic tundra include reindeer (caribou), musk ox, Arctic hare, Arctic fox, snowy owl, lemmings, and even polar bears near the ocean. Tundra is largely devoid of poikilotherms such as frogs or lizards. Due to the harsh climate of Arctic tundra, regions of this kind have seen little human activity, even though they are sometimes rich in natural resources such as petroleum, natural gas and uranium. In recent times this has begun to change in Alaska, Russia, and some other parts of the world: for example, the Yamalo-Nenets Autonomous Okrug produces 90% of Russia's natural gas. A severe threat to tundra is global warming, which causes permafrost to melt. The melting of the permafrost in a given area on human time scales (decades or centuries) could radically change which species can survive there. Another concern is that about one third of the world's soil-bound carbon is in taiga and tundra areas. When the permafrost melts, it releases carbon in the form of carbon dioxide and methane, both of which are greenhouse gases. The effect has been observed in Alaska. In the 1970s the tundra was a carbon sink, but today, it is a carbon source. Methane is produced when vegetation decays in lakes and wetlands. The amount of greenhouse gases which will be released under projected scenarios for global warming have not been reliably quantified by scientific studies, although a few studies were reported to be underway in 2011. It is uncertain whether the impact of increased greenhouse gases from this source will be minimal or massive. In locations where dead vegetation and peat has accumulated, there is a risk of wildfire, such as the 1,039 km2 (401 sq mi) of tundra which burned in 2007 on the north slope of the Brooks Range in Alaska. Such events may both result from and contribute to global warming. Tundra on the Kerguelen Islands. Antarctic tundra occurs on Antarctica and on several Antarctic and subantarctic islands, including South Georgia and the South Sandwich Islands and the Kerguelen Islands. Most of Antarctica is too cold and dry to support vegetation, and most of the continent is covered by ice fields. However, some portions of the continent, particularly the Antarctic Peninsula, have areas of rocky soil that support plant life. The flora presently consists of around 300–400 lichens, 100 mosses, 25 liverworts, and around 700 terrestrial and aquatic algae species, which live on the areas of exposed rock and soil around the shore of the continent. Antarctica's two flowering plant species, the Antarctic hair grass (Deschampsia antarctica) and Antarctic pearlwort (Colobanthus quitensis), are found on the northern and western parts of the Antarctic Peninsula. In contrast with the Arctic tundra, the Antarctic tundra lacks a large mammal fauna, mostly due to its physical isolation from the other continents. Sea mammals and sea birds, including seals and penguins, inhabit areas near the shore, and some small mammals, like rabbits and cats, have been introduced by humans to some of the subantarctic islands. The Antipodes Subantarctic Islands tundra ecoregion includes the Bounty Islands, Auckland Islands, Antipodes Islands, the Campbell Island group, and Macquarie Island. Species endemic to this ecoregion include Nematoceras dienemum and Nematoceras sulcatum, the only subantarctic orchids; the royal penguin; and the Antipodean albatross. There is some ambiguity on whether Magellanic moorland, on the west coast of Patagonia, should be considered tundra or not. Phytogeographer Edmundo Pisano called it tundra (Spanish: tundra Magallánica) since he considered the low temperatures key to restrict plant growth. The flora and fauna of Antarctica and the Antarctic Islands (south of 60° south latitude) are protected by the Antarctic Treaty. Alpine tundra does not contain trees because the climate and soils at high altitude block tree growth. The cold climate of the alpine tundra is caused by the low air temperatures, and is similar to polar climate. Alpine tundra is distinguished from arctic tundra in that alpine tundra typically does not have permafrost, and alpine soils are generally better drained than arctic soils. Alpine tundra transitions to subalpine forests below the tree line; stunted forests occurring at the forest-tundra ecotone (the treeline) are known as Krummholz. Alpine tundra occurs in mountains worldwide. The flora of the alpine tundra is characterized by plants that grow close to the ground, including perennial grasses, sedges, forbs, cushion plants, mosses, and lichens. The flora is adapted to the harsh conditions of the alpine environment, which include low temperatures, dryness, ultraviolet radiation, and a short growing season. Tundra region with fjords, glaciers and mountains. Kongsfjorden, Spitsbergen. Tundra climates ordinarily fit the Köppen climate classification ET, signifying a local climate in which at least one month has an average temperature high enough to melt snow (0 °C (32 °F)), but no month with an average temperature in excess of 10 °C (50 °F). The cold limit generally meets the EF climates of permanent ice and snows; the warm-summer limit generally corresponds with the poleward or altitudinal limit of trees, where they grade into the subarctic climates designated Dfd, Dwd and Dsd (extreme winters as in parts of Siberia), Dfc typical in Alaska, Canada, parts of Scandinavia, European Russia, and Western Siberia (cold winters with months of freezing), or even Cfc (no month colder than −3 °C (27 °F) as in parts of Iceland and southernmost South America). Tundra climates as a rule are hostile to woody vegetation even where the winters are comparatively mild by polar standards, as in Iceland. Despite the potential diversity of climates in the ET category involving precipitation, extreme temperatures, and relative wet and dry seasons, this category is rarely subdivided. Rainfall and snowfall are generally slight due to the low vapor pressure of water in the chilly atmosphere, but as a rule potential evapotranspiration is extremely low, allowing soggy terrain of swamps and bogs even in places that get precipitation typical of deserts of lower and middle latitudes. The amount of native tundra biomass depends more on the local temperature than the amount of precipitation. ^ Aapala, Kirsti. "Tunturista jängälle". Kieli-ikkunat. Archived from the original on 2006-10-01. Retrieved 2009-01-19. ^ a b c "The Tundra Biome". The World's Biomes. Retrieved 2006-03-05. ^ "Terrestrial Ecoregions: Antarctica". Wild World. National Geographic Society. Archived from the original on 2011-10-21. Retrieved 2009-11-02. ^ Higuera, Philip E.; Melissa L. Chipman; Jennifer L. Barnes; Michael A. Urban; et al. (December 2011). "Variability of tundra fire regimes in Arctic Alaska: millennial-scale patterns and ecological implications". Ecological Applications. 21 (8): 3211–3226. doi:10.1890/11-0387.1. ISSN 1051-0761. ^ "Great Plain of the Koukdjuak". Ibacanada.com. Retrieved 2011-02-16. ^ "Tundra". Blue Planet Biomes. Retrieved 2006-03-05. ^ "Tundra Threats". National Geographic. Retrieved 2008-04-03. ^ Walter, KM; Zimov, SA; Chanton, JP; Verbyla, D; et al. (7 September 2006). "Methane bubbling from Siberian thaw lakes as a positive feedback to climate warming". Nature. 443 (7107): 71–75. Bibcode:2006Natur.443...71W. doi:10.1038/nature05040. PMID 16957728. ^ Oechel, Walter C.; Hastings, Steven J.; Vourlrtis, George; Jenkins, Mitchell; et al. (1993). "Recent change of Arctic tundra ecosystems from a net carbon dioxide sink to a source". Nature. 361 (6412): 520–523. Bibcode:1993Natur.361..520O. doi:10.1038/361520a0. ^ a b c Gillis, Justin (December 16, 2011). "As Permafrost Thaws, Scientists Study the Risks". The New York Times. Retrieved December 17, 2011. ^ Mack, Michelle C.; Bret-Harte, M. Syndonia; Hollingsworth, Teresa N.; Jandt, Randi R.; et al. (July 28, 2011). "Carbon loss from an unprecedented Arctic tundra wildfire" (PDF). Nature. 475 (7357): 489–492. Bibcode:2011Natur.475..489M. doi:10.1038/nature10283. PMID 21796209. Retrieved 2012-07-20. ^ "Terrestrial Plants". British Antarctic Survey: About Antarctica. Retrieved 2006-03-05. ^ a b "Antipodes Subantarctic Islands tundra". Terrestrial Ecoregions. World Wildlife Fund. Retrieved 2009-11-02. ^ a b Longton, R.E. (1988). Biology of Polar Bryophytes and Lichen. Studies in Polar Research. Cambridge University Press. p. 20. ISBN 978-0-521-25015-3. ^ "Protocol on Environmental Protection to the Antarctic Treaty". British Antarctic Survey: About Antarctica. Retrieved 2006-03-05. ^ Körner, Christian (2003). Alpine Plant Life: Functional Plant Ecology of High Mountain Ecosystems. Berlin: Springer. ISBN 978-3-540-00347-2. Allaby, Michael; Peter D Moore; Trevor Day; Richard Garratt (2008). Tundra. Facts on File. ISBN 978-0-8160-5934-8. Bliss, L. C; O. W. Heal; J. J. Moore (1981). Tundra Ecosystems: A Comparative Analysis. International Biological Programme Synthesis Series (No. 25). ISBN 978-0-521-22776-6. Warhol, Tom (2007). Tundra. Marshall Cavendish Benchmark. ISBN 978-0-7614-2193-1. Yu I, Chernov (1998). The Living Tundra;Studies in Polar Research. Cambridge University Press. ISBN 978-0-521-35754-8. Wikimedia Commons has media related to Tundra. Look up tundra in Wiktionary, the free dictionary.